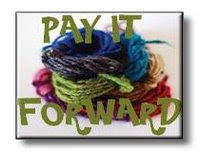 This week I signed up for Myra's Pay It Forward exchange fun. Pay It Forward Exchange is based on the concept of the movie "Pay it forward". I will send a hand made gift to the first three people who leave a comment to this post on my blog requesting to join the PIF exchange. All the gifts will be made and posted out 'sometime within the next year'. How exciting to not know when your surprise package will arrive! What you need to do in return, is pay it forward by making the same promise on your blog. This Exchange is only open to those with active websites or blogs. I'd love for you to join me! Will you? Other comments are welcome, but only the first three will be my Pay It Forward recipients. I'll do it! How fun!! I would LOVE to be in on this. How exciting! !